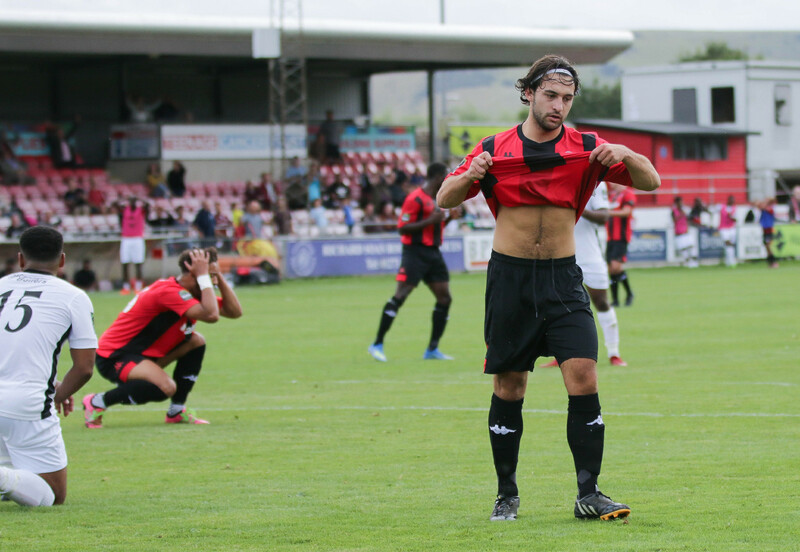 It was the case of déjè vu at The Pan yesterday as the Rooks lost to fellow-promoted Carshalton Athletic by a single goal for the fifth consecutive time, reports Stuart Fuller. Manager Darren Freeman was able to name a few new faces in his starting XI including Lewis Carey in goal and Nassim Dulaki in midfield, with the returning Stacey Freeman starting his first competitive game in a year at the back and Bouwe Bosma returning on loan from Coventry City. It was a nervous opening, with both sides playing a similar formation, looking to get their full-backs overlapping which on many occasions cancelled each other out. James Hammond had a great chance on the half-hour mark, running onto a cleared ball at the edge of his area but his shot flew wide. One incident in the first-half that got the crowd talking came after a long James Hammond ball saw Jonte Smith get the right side of the centre-back but appeared to be hauled to the ground before he could reach the ball. Neither team could complain about the goal-less score line at half-time, reflecting the closed-match nature of both sides who ran each other so close last season. The Rooks had the first chance of the second half when Frankie Chappell's powerful header from a corner was headed away in the six-yard box having cleared the Carshalton keeper Bishop. On the hour mark Carshalton grabbed the opening goal, from a move that infuriated the management team. A hopeful ball hit diagonally into the area from Paris Hamilton-Downes floated over the Lewes defence and Ola Sogbanmu had time to bring it down, take a step forward and calmly slot it past Carey from 8 yards. Ten minutes later and the visitors were reduced to 10 men when Raheem Sterling-Parker's robust challenge on Steve Brinkhurst was deemed dangerous by the referee, after consultation with his assistant. The Rooks started to gain in confidence. Frankie Chappell forced another save from Bishop after getting on the end of James Hammond's flick whilst a Nico Cotton goal-bound shot was deflected over. But the moment that had all Rooks fans thinking we had equalised came in the last minute when Billy Medlock's fast feet took him past a defender and his shot hit the outside of the far post. It was a disappointing result for the Rooks although there were some real positives from the performance. After the match Darren Freeman spoke to Barry Collins about the game and how he felt the Rooks deserved at least a point. Highlights from the game, thanks to YourInstantReplay, can be viewed here. The e-Programme can be accessed here. Photos, courtesy of James Boyes can be viewed here. The Rooks head to Tonbridge Angels on Tuesday night, kick off 7.45pm in the Bostik League Premier Division.